Bernina 230? 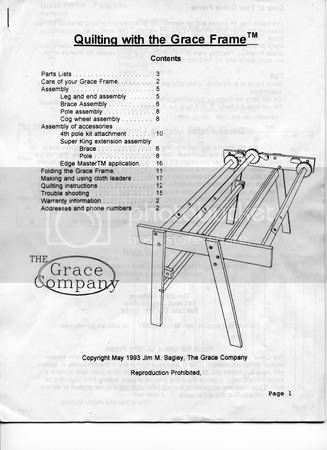 Wooden Grace quilting frame price? Thread: Bernina 230? Wooden Grace quilting frame price? I’m going to look at a 7 yo Bernina Activa 230 Patchwork Edition. It comes with 5 feet, walking foot, large extension table and wheeled case. She is asking $300. The reviews seem good. The price seems like unless it looks like it was left in the rain and dropped down a flight of stairs I should buy it. Any problems with that line from that age that are known? My second question is about a wooden Grace quilting frame. It has never been used but is missing its hardware package. What would a good price be? Don't have specific knowledge of that model of Bernina, but it sounds like a very good deal to me! Regarding the wooden quilting frame, if it had all of its hardware it would be worth no more than half the price new (check online for new prices); without the hardware, I would say somewhere between 25% and 33% of its original price. Thanks for the response. The thing is I can't find the same model. It is all wood and appears to have roll bars for the quilt on the outer supports. There is nothing like it on their website. This is the instruction book. I just purchased the Bernina 350 - it is a nice small machine that will be easy to take to classes and it sews like a dream! I would think the 250 would be the same. Good luck. Without the hardware, I would think about $50 would be fair. I remember seeing a photo of someone who bought an older frame like this at a thrift shop. It had the hardware and was less than $100, but I do not remember any other details. without the hardware package, i would be leery of buying it. if you have the full manual, it should have pictures of the parts in the hardware package. then you can see if those parts can be purchased at the hardware store or even directly from the grace co. It is all standard hardware store stuff. Just washers and hex bolts mostly, I would guess $10-$20 worth. Contact Grace Co. and see if they can supply the hardware. I have a Grace frame. Like it but do not like the short arm that goes with it. Along arm would be better.